On our last day in Hiroshima, we went off the beaten path to the small town of Saijō. Located a scenic 45-minute train ride from Hiroshima Station, Saijō is famous for being home to 10 of Japan’s best known sake breweries, earning it the title of Japan’s Sake Capital. First things first. I owe sake an apology. When I had my first beer at, let’s say, 21 years old, I was not a fan. It was probably some garbage like Coors Light. But as I discovered craft beer, I found a love for the creativity and passion brewers put into their products. Each is unique, the character of the individual brewer represented in every beer. I didn’t like sake when we came to Japan and frankly wasn’t interested in trying it until a few months ago. If you agree with me, you’ve probably only been exposed to table sake like I had been. It turns out the sake brewing industry is as diverse and creative as the American craft beer scene. 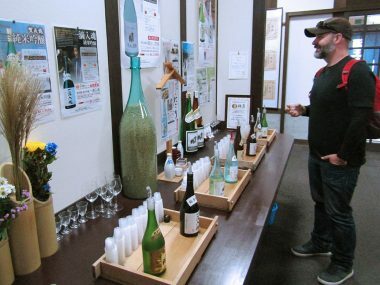 In touring six of the eight breweries in Saijo’s city center, we learned more about sake than we ever thought possible. There are strict guidelines for way rice is milled, how long the sake ferments and at what temperature. There are two distinct styles that have different flavor profiles from brewer to brewer. First, the word “sake” itself isn’t entirely accurate. In Japanese, “sake” means “alcohol” or “liquor” and refers to all alcoholic beverages. I once asked the shelf-stocker at the grocery store where the “sake” section was. He pointed to the entire beer, wine, etc. cooler with wide arms outstretched. If you want “sake” in Japan, you want nihon-shu, or Japanese liquor. You can also find shochu, a distilled spirit closer to brandy or vodka. 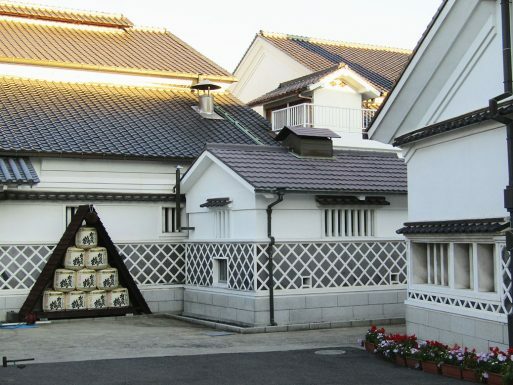 The quality of sake depends on how much of the rice bran has been milled away before the brewing process begins. For table sake, there are no minimum requirements for the milling, while the best quality daiginjo/junmai-daiginjo has 50-60% of the bran milled away. The rice is a special variety that is only used for sake—it actually tastes horrible on its own. More than 80 varieties of sake rice are grown in Japan. Table sake is the lowest quality of sake. If you’ve ever had hot sake or sake from a large plastic jug, you’ve had table sake. It’s the most common, making up 80 percent of the sake market, and usually tastes closer to rubbing alcohol than something you want to kick back with. For premium sake, production branches into two paths. Honjozo, Ginjo and Daiginjo are made with pure distilled alcohol added into the brewing process. It results in bright, fragrant and crisp flavors. The Junmai styles don’t contain any distilled alcohol, instead relying on the natural alcohol created by the fermentation caused by Koji mold. Junmai sake has a fuller flavor profile with a thicker mouthfeel. 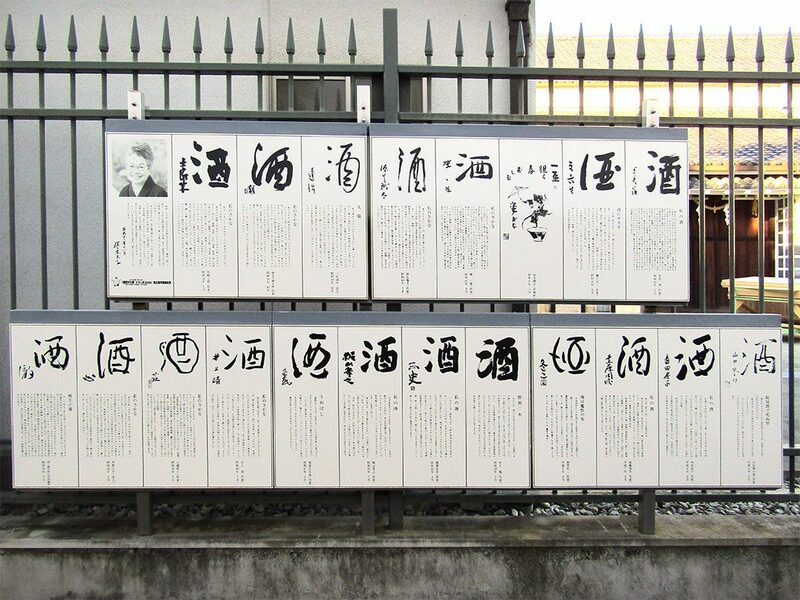 Saijō knows sake is what brings the visitors to town, so as soon as you exit the gates at JR Saijo Station, you’ll find the visitor center offering maps (in English!) guiding the way to the city’s various breweries. You’ll be offered variations of this map at each brewery as well. We collected three different brochures before we started turning them down. 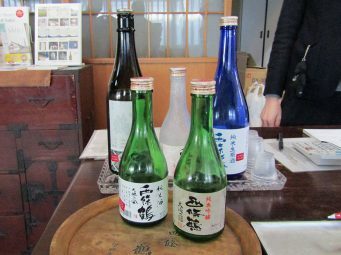 A sample of the Sanyotsuru Hachimaru Junmai, a typical table sake. We bought a couple of the “Fuji” glass that the samples were served in. The well at Hakubotan Brewery. 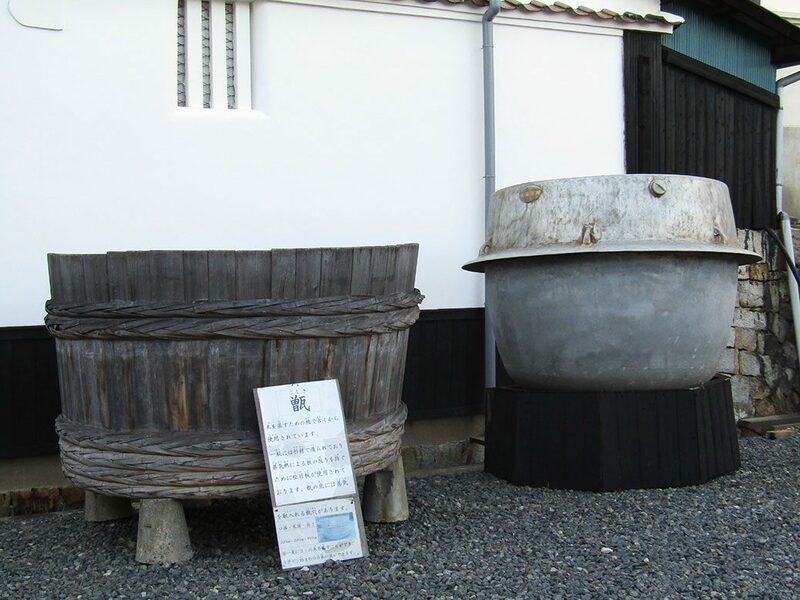 The pure drinking water is part of what gives Saijo sake their unique flavors. 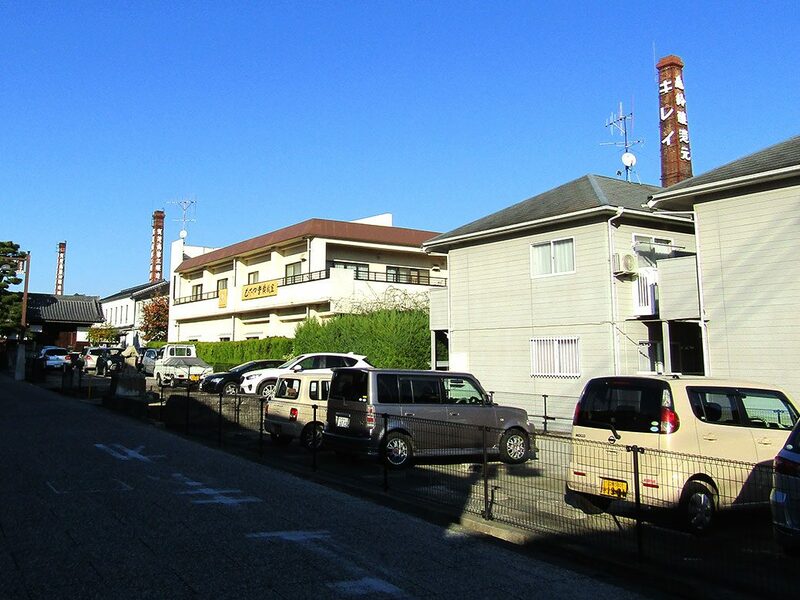 From there, we walked to the center of town, arriving at Hakubotan.Hakubotan is the oldest brewery in town with origins dating back to 1675. Outside, their well offers free drinking water to passer-bys (one man was filling up his drinking water jugs to take home), the same water used to make the sake. The fresh spring water is part of what gives Saijō sake its unique flavor. The folks at Hakubotan weren’t quite ready for us on a Wednesday afternoon, but they broke out the bottles and offered three good quality sake samples. 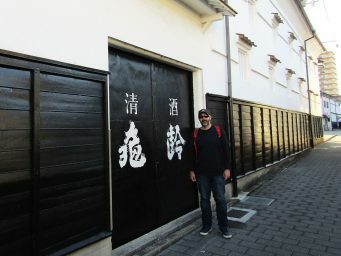 The doors to the warehouse of Saijotsuru Brewery. Today’s building looks exactly as it did when the brewery was founded in 1904. 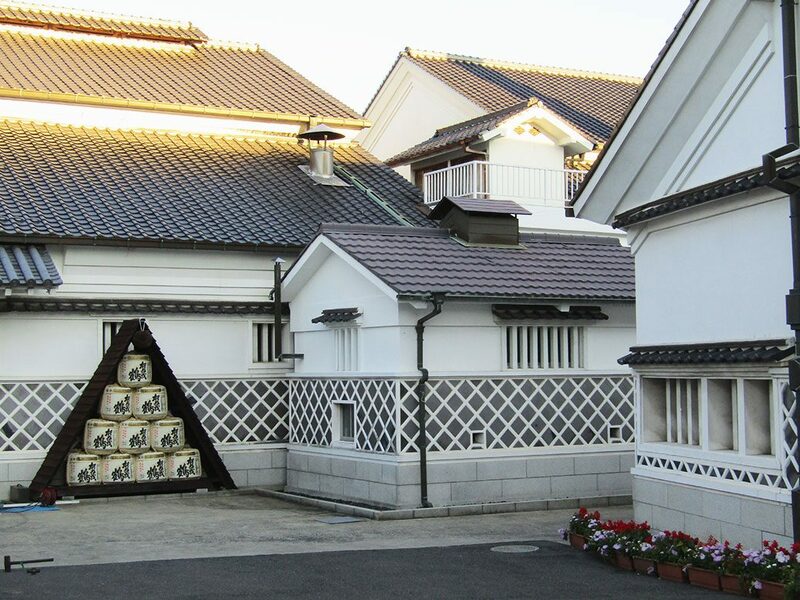 The chimneys of three of Saijo’s sake breweries rise above the modern apartments. Only Saijotsuru still uses its chimney in production, but the preserved steam stacks are part of the attraction today. The generous samples at Saijotsuru Brewery. This was the third brewery we visited and we felt a little light on our feet after this one. Across the street, we popped into Saijotsuru. 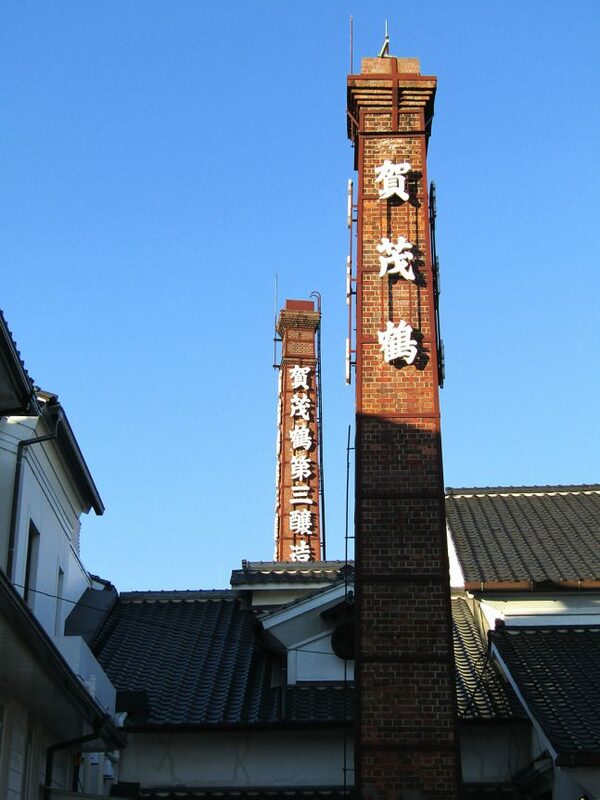 Saijō’s history is charmingly on display with the tall brick chimneys that were used in the traditional brewing process, but Saijotsuru is the only one that actually still uses its chimney in production. The overachiever in town, it’s unfiltered Junmai-Daiginjo has won 10 consecutive Monde Selection Gold Medals. Saijotsuru was also the most generous in its samples. One other customer was in the tasting room and had likely been there for awhile based on the glow in her cheeks. In addition to the five bottles on the tasting counter, the tasting expert pulled a couple more bottles off the shelf for us to try. We were starting to get a little light on our feet after our visit. The Kirei Brewery building is often used in the photos promoting the town. Its sake is unique as its more dry where Hiroshima sake is typically sweeter. They’re also famous for their sake-infused udon noodles and soaps. We wobbled down the street another block to Kirei. We were met by an older man who gave us a bit of the side eye. He seemed really nervous and the vibe was a little odd. In hindsight, I think he was anxious about having to use his English. After a few minutes and a few questions about his sake, he started to lighten up a bit. Kirei’s sake was unique in that it was a lot drier than the other breweries. The crisp flavor was a nice break from the sweeter varieties. The samples at Kamoizumi were some of my favorites of the day and the host was great. 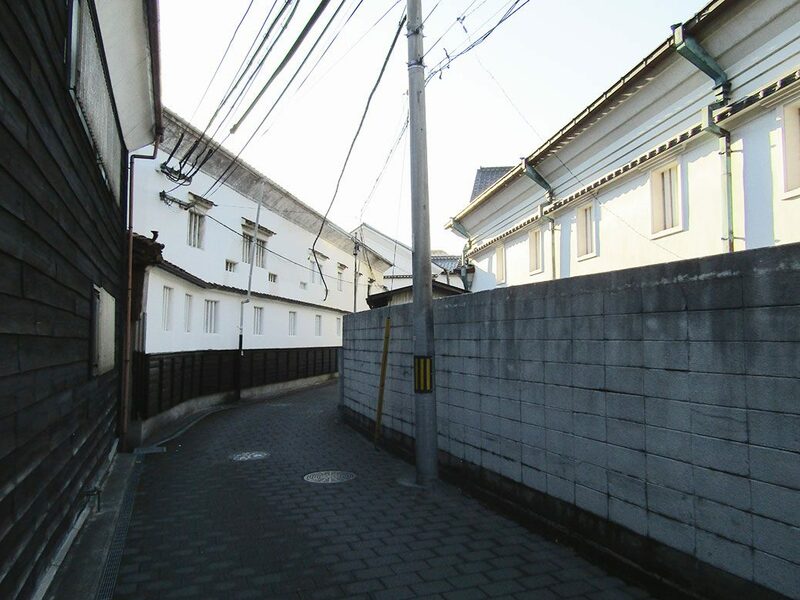 We walked to the end of the street where we were met by a goofy young man at Kamoizumi. 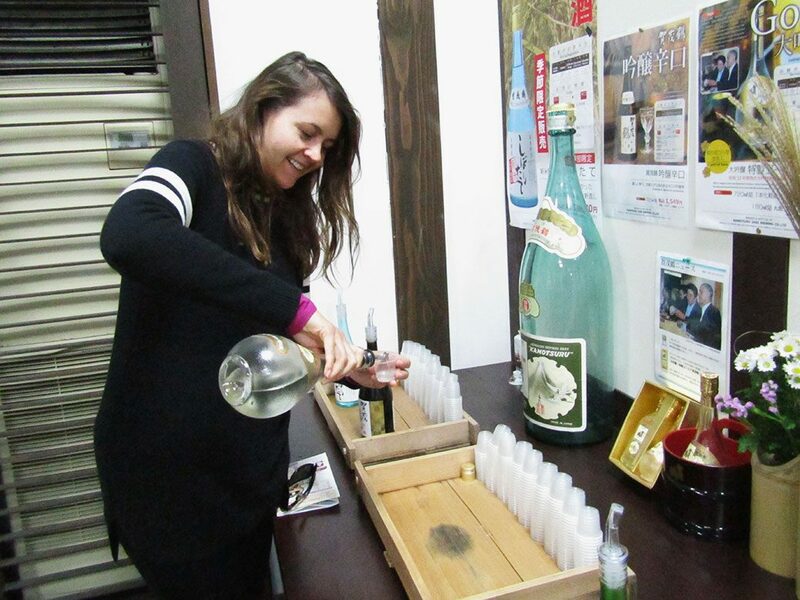 He gave us a sample of their drip-pressed Junmai-Ginjo, which ended up being one of my favorite tastes of the day. He also told us Hillary Clinton had visited a couple weeks before and bought a bottle of $200 sake. While I couldn’t verify this visit in the news reports, it made a nice story. We were about sampled out, but he suggested we make one more stop at Kamotsuru. The chimneys for Kamotsuru Brewery, easily the most impressive brewery on the tour. 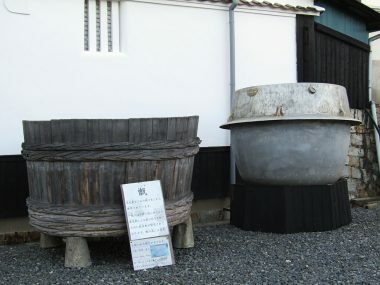 At Kamotsuru Brewery, an old rice steaming vat (right) and its wooden rice basket. This vat could hold three tons of rice and produce 4,000 bottles of sake. Kamotsuru lets visitors pour their own samples. Dangerous! Trying to look normal while working my way through the samples at Kamotsuru. 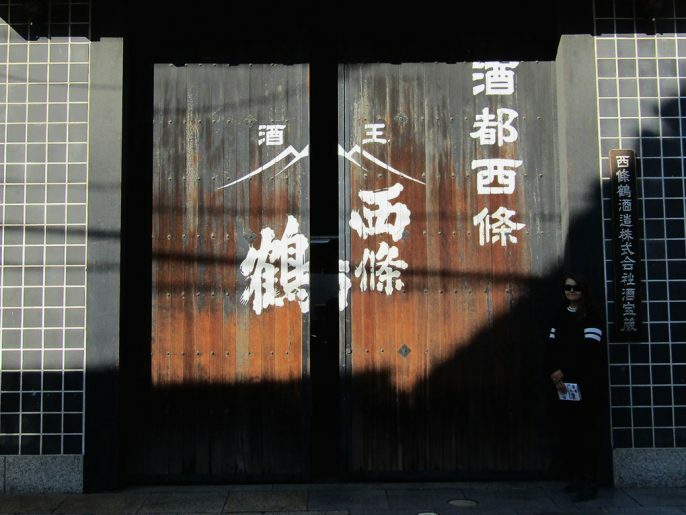 A brown bushel of cedar branches called sugidama hang in the doorway of every sake brewery. They’re green when they are placed after the first bottle of sake for the year has been produced. When the branches turn brown, the sake is ready to drink. Sake barrels are stacked at Kamotsuru Brewery. 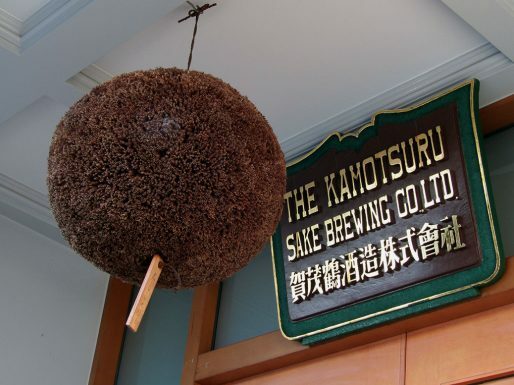 This is a traditional way for brewers to ask for prosperity in the Shinto religion. Kamotsuru is the Hiroshima sake, brewing under its current name since 1873. It uses Japan’s best rice and employs Japan’s best brewers. It’s been the favorite of Edo period feudal lords and was the first brewery to make premium sake available to the general public. But for all of its history, Kamotsuru earned a new place in Japan’s popular culture thanks to a hastily snapped photo in 2014. U.S. President Barrack Obama was visiting Prime Minister Shinzō Abe in Tokyo and the pair dined at the famous Sukiyabashi Jiro sushi restaurant in Tokyo. (Side note: If you haven’t watched the wonderful documentary Jiro Dreams of Sushi, check it out ASAP.) A photo of Abe pouring Kamotsuru’s Daiginjo Tokusei Gold into Obama’s cup made the world news circuit and reignited the brewery’s popularity. The photo appears several times in the tasting room as part of the marketing for the Daiginjo Tokusei Gold. And it worked as it was among the bottles we brought home with us. Each bottle features two gold foil flakes in the shape of cherry blossoms. In addition to the samples at the breweries, the walk itself is rather enjoyable. Sakagura Dori—or Sake Storehouse Road—gives a taste of what life might have been like in the 1600s as the Edo-era lords came to enjoy the best sake in the world. Each of the breweries have painstakingly restored their buildings, including original features whenever possible. The bright white storehouses stand in contrast to the gray modern apartments and shops that now share space with them. The old streets running between the breweries offered a glimpse into life during the area’s heyday. The well-preserved and still operating Fukubijin Brewery warehouse. 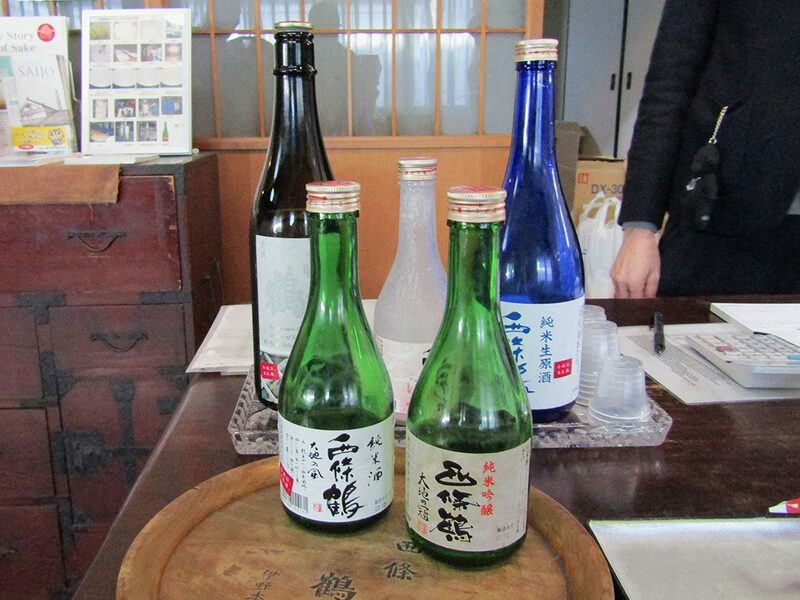 Fukubijin was Japan’s first incorporated sake brewer and ran the national brewer’s training school until the 1970s. 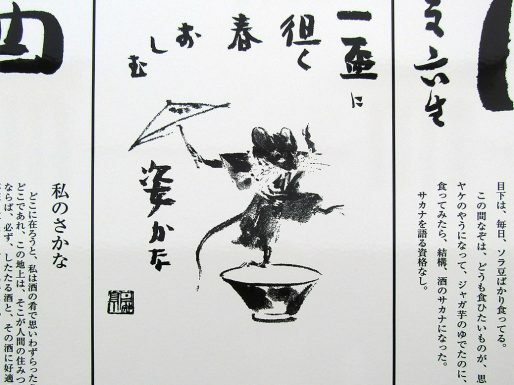 The city’s sake brewers hand-drew the mark for “sake” along with a biography of their brewery. 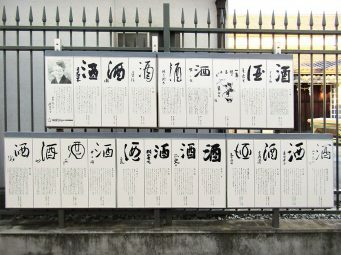 Each provided a glimpse into the different personalities that go into creating sake. 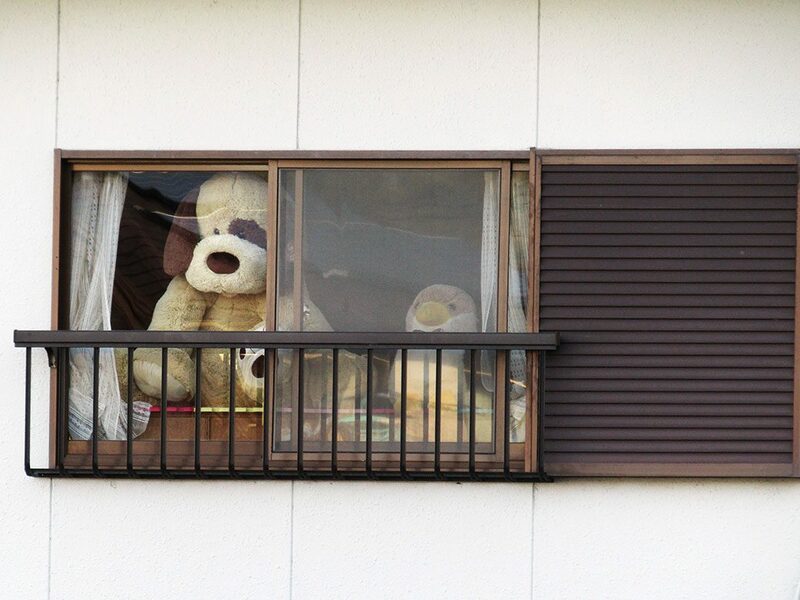 These guys were peering out the window of an apartment. After our fifth brewery, it was a pretty hilarious sight. Saijō was a great way to wrap up our Hiroshima adventure, getting out of the city for a taste of the countryside. For more details on the city and the walking tour, head over the Saijō Sake website.